Annually, around this time of year, I write a safety update for our District’s blog. Each year, I read what I wrote in prior years, so I don’t take the progress we’ve made for granted or forget something important that we take as a matter-of-course and forget to highlight it as a point of pride. Schools take care, for a few brief hours every day, of the most important people in our worlds. In Oak Creek we have strong partnerships: our parents care, our staff is prepared and committed, and our children come to school wanting to do their best. Although we may think something bad couldn’t happen here, we must stand prepared to mitigate risk and protect students. Our primary focus will always be the safety of our learners--today I’m writing a little deeper to share an overview of some of the plans and protocols we have in place to prepare our schools for various types of situations and to keep our students safe. Last year I wrote, “One of our core values as a School District is Safety. We believe that schools and work sites must be safe and secure environments for students, parents, and employees--emotionally as well as physically. Our schools should be safe for everyone who comes into them--kids, our staff, and all our families and other visitors.” Those words are as true today as the day they were written. Our commitment to providing resources through our partnership with the Oak Creek Police Department, and embedding developmentally appropriate practices for emergency preparedness into our schools has put us in a position to share what we’ve learned about helping to make our schools the safest places we can, both with our neighbors in the region, and further around the country. If you’re really looking, you can see some of the outward safety elements, like staff greeting our kids when they get to school, or opening the lines of communication when a child may not seem like their regular self--these are nice things, they also help keep our kids safe. Sometimes when we pick up our children during the day, we buzz the secure door and have to show who we are, and if we’re staying to visit, get a badge. Perhaps you’ve seen numbers on windows, or badges on your kid’s teachers--maybe you have completed your volunteer background check to go along on a field trip. Maybe your child is involved in some kind of positive group with their school counselor, or perhaps they serve as a cadet, or on some sort of council. Perhaps they had a slip-up and experienced some restorative discipline where they righted a wrong, or made amends. All these experiences are part of a broader plan, with dozens of moving parts, each designed to make school as safe as we can. In this blog, I’ll share a few important, but not always visible behaviors we practice to support safety as one of our core values. Visibly, upon entering our schools, you’ll notice all of our Oak Creek-Franklin public schools have locked, secure entrances--external doors are locked during the school day--essentially putting our schools in what’s commonly called “Lockout” all the time. Classrooms are equipped with aftermarket locking panels, which allow for a speed-locking of sorts. Visitors must be buzzed-in the secure entry door before entering the building. And, if a visitor plans on staying in the school building for any length of time, or moving beyond the lobby, they do what’s called a “credential exchange,” using the Raptor System. The Raptor System is basically a digital system for signing-in and getting a badge. Raptor scans the user’s ID against databases for any violation that would prevent the individual from being able to enter a school. Raptor also creates a daily record of who is in the building and when. Upon close inspection, you’d notice our door-glass is covered with a special polimer designed to prevent shattering, and we even landscape in a way that prioritizes visibility over esthetics. 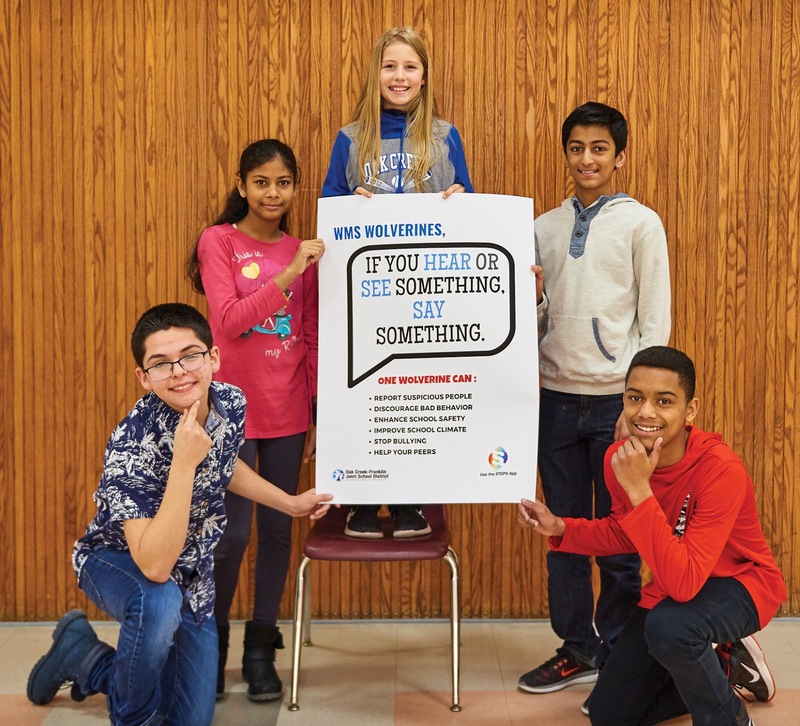 These upgrades were made possible through the nearly $600,000 school safety grant awarded to the Oak Creek-Franklin School District in the fall of 2018. Out of sight in all our buildings are direct notification systems allowing members of our staff to connect directly to law enforcement. Imagine a situation where many individuals are calling emergency services at the same time; this system, so to speak, allows us to jump the line, and share the location of the crisis immediately. In testing, we’ve learned that response to our schools is very quick, and we know that Oak Creek Police will immediately enter our facilities in a crisis. Cedar Hills second graders visit the OC Police Station. All adults in our schools are committed to safety. A select group of those committed individuals serve on each school’s Safety and Crisis Team. These teams convene multiple times a year and are committed to regularly refining and improving their site plans; site plans comply with best practices we’ve learned from FEMA, among others. It’s not uncommon for the teams to convene after a drill, severe weather incident, or other real/practical concern. The teams do a debrief and focus on identifying process improvements. The same way we ask for each classroom to continuously improve, so too do we approach safety planning. Procedures are discussed and practiced at each of the buildings. We also meet regularly as a District-Wide Crisis Team, pulling in our community partners in the local fire and police departments. Later this year, our schools will be awarded the StormReady certification by the National Weather Service. Through coordination between local weather personality Mark McGinnis, the National Weather Service, and our Building and Grounds Department, we’ve reviewed all our storm shelter locations in order to ensure that we have thoughtfully planned for severe weather and have designated the best possible locations at all our facilities as storm shelters. In the coming months, our Board will be presented with this new accreditation. Each spring in coordination with our partners in the Oak Creek Police Department, we perform reviews of both our entry/exit processes and school safety plans at each building. Local law enforcement helps us ensure that we are aligning with evolving best practices in facility safety. It might not seem like a big deal, but the world of school safety is evolving so quickly, we want to ensure we’re asking our local experts about how we can continue to improve. 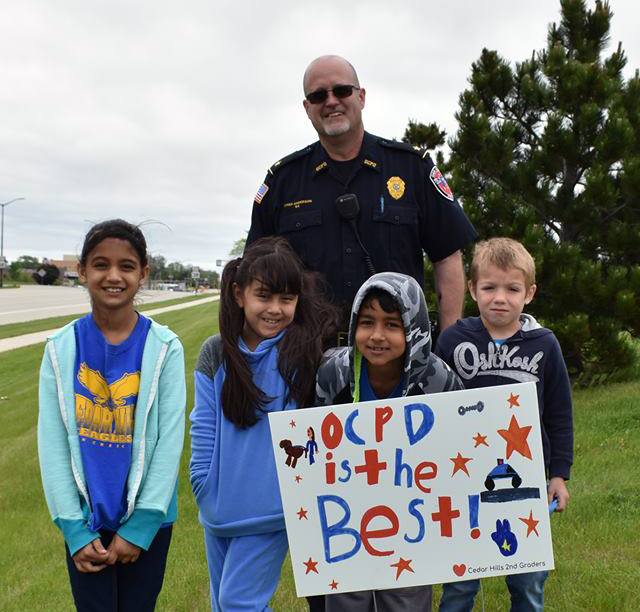 The school district and the schools have a close relationship with the Oak Creek Police Department. We have two dedicated school liaison officers that are exceptional partners in the day-to-day safety of our schools. They advise us regularly and are integral to our training and preparation. You’ll find Officer Tim Zwicke at the high school every day; Officer Shawn Lentz spends time in all our schools. We also support and encourage other day-shift officers to visit our schools for lunch, or just to check in; these are informal visits and promote community partnership as well as visibility. It is extremely common to see a squad parked in front of our schools for non-emergency reasons, like school concerts, or other events. In addition to providing a pure law enforcement based safety measure, our SROs advise and counsel in ways at times similar to a school counselor. The SROs also share what we call “five minute Friday,” messages that invite discussion and call for considering scenarios in a table-top format; these activities help us create the mental maps that save seconds in a crisis. All schools perform evacuation drills and lockdowns on a regular basis. Our schools conduct safety drills that exceed statutory requirements. In addition to fire and tornado drills, our staff and students plan and practice for situations where we may need to “lock-out” (entrances secure, inside Physical Education and recess), “lock-down” (classroom doors), or potentially “evacuate” to another classroom, location in the school, or even to an alternative site. Fire and tornado drills are required by law every month, and twice a year, respectively. Crisis or safety drills are now also required in our state, and we perform a minimum of three safety related drills a year at every school in the District. We call these drills “evacuate,” “shelter,” and “hold.” Your student might not notice, as we use age-appropriate terminology, like “buddy-room drill” in an elementary school to move quickly from a home classroom to a partner classroom--for something like a health emergency or a quick evacuation--or your student might practice coming in from recess really fast. Each of our schools plan and prepare for these types of events and the Oak Creek Police Department tests and/or advises us on these protocols. We don’t, however, just discuss and train for shelter-in-place situations, our training teaches us that we must consider situations in advance in order to create the preparation in our minds to exercise judgement--if a situation should require our staff to evacuate or defend our room--as horrible as that sounds and feels, we’ve considered that possibility in advance. For example, our staff are empowered to evacuate if safety permits and danger is close. We have also worked with FEMA and the Wisconsin School Safety Coordinators Association (WSSCA) to audit our protocols. None of these actions are required, but we dedicate time and energy to these practices because we wholeheartedly believe in the values of preparation, resource gathering, and planning. Our District has dedicated a significant amount of professional development time to educating our staff about high-level safety and security measures and practices--in recent years nearly half our inservice time has been dedicated to safety training. Our teaching staff has successfully completed what the Oak Creek Police Department calls tier 1 and/or tier 2 active shooter training. 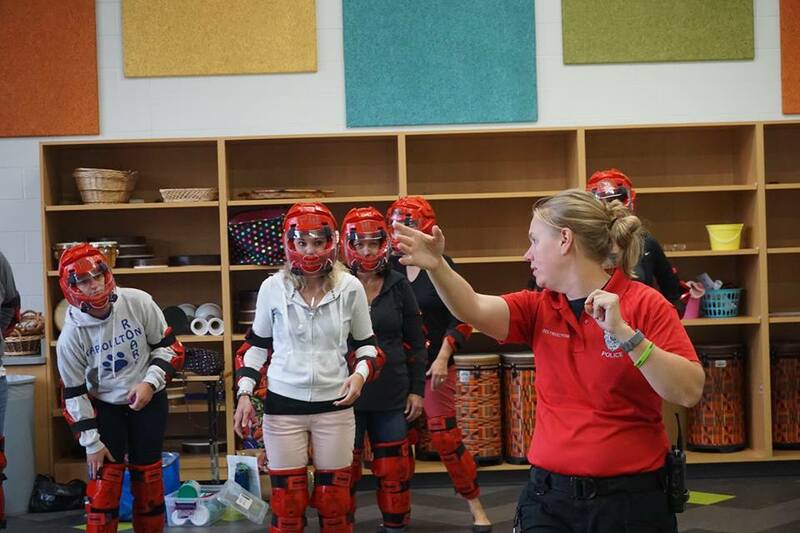 Some of this training is hands-on, resembling a self-defense, or martial arts class. New teachers, as part of their orientation to the District, receive special workshops in verbal de-escalation and school safety preparedness--in addition to the tier 1 and 2 training. And the police design custom training for people like front-office administrative assistants--these are emotional and challenging meetings--very few teachers or office workers thought this would be a part of the job when we set out down this road many years ago. Additionally, law enforcement regularly trains in our schools during off-hours, and has early access to our buildings every summer. This will be the case as well with all new construction. In 2012 we started equipping our schools with cutting-edge safety kits--similar to what you’d find in tactical response vehicles. These kits are not widely available, nor often observed elsewhere. You might hear about requiring similar kits through legislation in the wake of a traumatic event, as they contain supplies necessary to render life-saving aide. The Oak Creek Fire Department builds, updates, inventories, and trains our staff on the use of these kits. PTOs commonly fundraise for replacement materials for these kits, as the contents expire and are costly. You may hear on television after a traumatic event that there should have been what’s called a “Threat Assessment”. This is a meeting of sorts where a team from within and beyond a school come together to gather information and create what looks like a treatment/care/communication plan. This process often brings law enforcement together with a school’s team to share information. Our District has engaged in this practice for a number of years--which is uncommon and to our credit as a community. A threat assessment has so much potential value that as a requirement to access state safety grant funds from the Department of Justice, Wisconsin school districts must send a significant percentage of staff to a custom training on the subject. Please know our staff is ready and available to help students who are fearful or uncomfortable. Please do not hesitate to encourage them to reach out to us so we may help your children through this time. 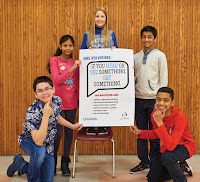 High school and middle school students and their families also have access to the Aurora Student and Family Assistance Program, a unique program that gives families access to free, confidential counseling services. This is similar to employee assistance programs you may be familiar with from work. Aurora works with three or four southeastern Wisconsin schools to provide this unique and valuable service at no cost to our secondary students and families. At the beginning of the 17-18 school year, all Oak Creek-Franklin students were given access to a tool called STOPit. STOPit is an app that gives students the ability to anonymously report any inappropriate behavior directly to a school administrator. It can also be used to engage in anonymous two-way communication with school officials. This year, the week of March 4th, our schools will launch school safety week. All students will learn valuable skills useful both in school and in the broader world. Students in grades PK-3 will participate in a series of lessons, designed in collaboration between a team of school psychologists, early childhood teachers, special education teachers, and local law enforcement. Students in grades 4-12, in addition to the lesson (adapted for level), will see a public service announcement-style video, created by our pupil services team, Knight Vision Productions (our student TV organization), and local law enforcement. Click the image above to view the safety video. 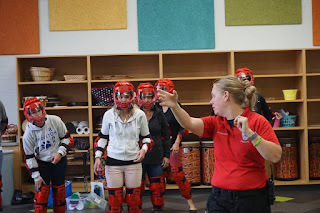 Essentially, we want to further the training arm of the Oak Creek Police Department, Peaceful Warrior Training Group's motto, “we want to prepare, not scare.” We want our students to walk away empowered with tools for school, or in any situation where the skills we teach could help them move more safely through a sometimes uncertain world. And we want to solidify the language of our drills: “Lockout,” “Lockdown,” “Evacuate,” “Shelter,” and “Hold.” That language, by the way, is taken from the I love you guys Foundation, a national organization endorsed by the Wisconsin Department of Justice. 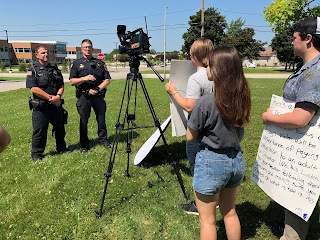 Knight Vision Production students film safety video with OCPD. Please discuss with your student the expectation to tell a trusted adult (in person, through email, or with STOPit) as soon as possible if he or she EVER hears or sees anything that is inappropriate in any way. As our partners the police always stress, “If you see or hear something, say something.” Please help us by reinforcing this important message. In addition, it’s important to talk with your children about safety at school and the importance of following instructions in the event of an emergency. We encourage you not to be afraid to talk to your children about incidents of violence, but caution you not to let your children be overexposed and consumed by either the news or social media coverage. The National Association of School Psychologists has created a document titled “Talking to Children About Violence: Tips for Parents and Teachers.” This document provides practical tips for families when discussing such incidents with their children. The National Association of School Psychologists’ website www.nasponline.org provides links to this document and other documents families may find helpful. Be sure your contact information in Infinite Campus is up to date. In the event of an emergency, Infinite Campus will be used to contact parents and guardians. At the beginning of each school year, we conduct a test of the emergency notification system for parents and staff. If you have Infinite Campus account questions, please email: helpdesk@ocfsd.org. Here in Oak Creek-Franklin, you’ll find a few things that you might not see in other Districts, like secure entrances at all the buildings, safety drills that exceed statutory requirements, teachers and administrators dedicated to restorative disciplinary practices, and a robust relationship with our police and fire and rescue departments. Some of the scarier things we plan for, we hope we never need. However, we feel the investment in time, energy, and those moments of being uncomfortable or stretched in our thinking about being ready for hard things that may never come are worth our time and efforts. We are deeply committed to examining the steps we need to take for student safety. We have worked together to build strong practices, and we remain committed to looking at the areas we have not yet addressed. Please reach out to us if you have questions or concerns so we can keep an open line of dialogue around school safety. I hope you’re proud to send your kids to schools where we take seriously the charge to put safety first--I know I’m proud to work for one.